The crafting ladies of Kleine Kammermusik (L to R): Stephanie Corwin, Becca Humphrey, Meg Owens. What does cross stitch and embroidery have to do with Baroque music? During the breaks in our rehearsal schedule, the ladies of Kleine Kammermusik —Stephanie, Meg, and Becca — all enjoy taking out their crafts: knitting, embroidery, hand-made satchels for instruments, and scarves for the winter. 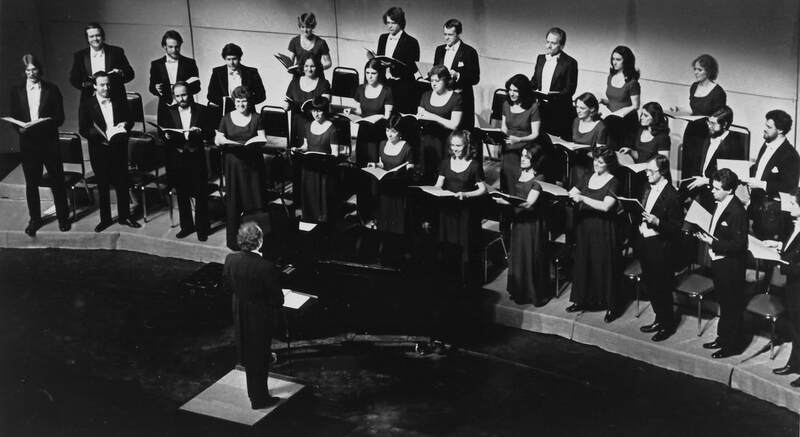 Ahead of the Michael Korn Concert Tribute 2018, we present archival radio broadcast of a program dedicated to the memory of Michael Korn, founder of The Bach Festival of Philadelphia, The Philadelphia Singers and Chorus America. The program, hosted by the late Gene Parrish, features interviews with Korn's colleagues and recordings of The Philadelphia Singers conducted by Michael Korn. Ahead of the Michael Korn Concert Tribute 2018, we are thrilled to share with you some rare historical photographs that were kindly provided to the Bach Festival and Choral Arts Philadelphia by Michael's long-time associate, Janice Bryson. PHOTO 1: Philadelphia Singers at the Walnut Street Theater, Korn conducting. Photo by Trudy Lee Cohen, 1985.